We love pancakes, but when I make them for my family I am always flipping pancakes well after everyone is finished eating. For Father's Day, Jon requested German Pancakes, which are 100 times easier to make than their buttermilk cousin. I had never had German pancakes, or volcano pancakes as my kids like to call them, until after I was married. The recipe I use is one that my mother in law gave me. Once oven is heated, put the butter in a 9 x 13 Pyrex pan and place the pan in the oven. Put the remaining ingredients (eggs, milk, flour, and salt) in the blender and blend until they are well combined. When the butter in the oven has melted and begins to sizzle, pull out the oven rack and CAREFULLY pour the blended ingredients into the pan. 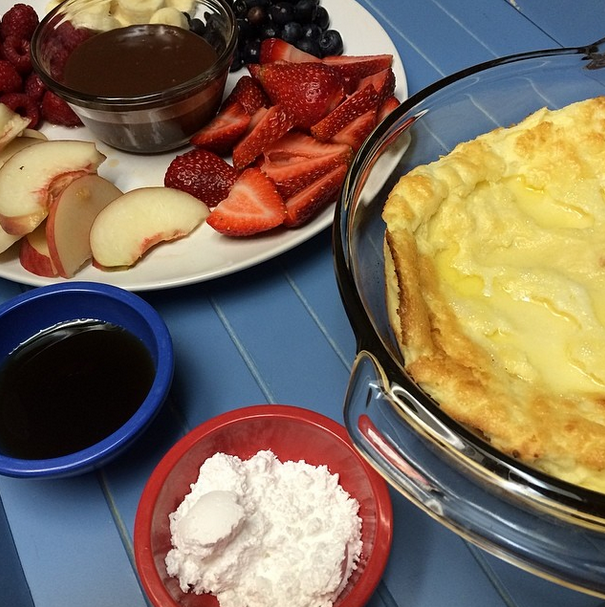 For Father's Day we had a German Pancake bar of sorts. Everyone got to pick their favorite toppings. Some of our favorite options are fresh fruit, chocolate ganache, syrup, powdered sugar, and whipped cream. I love to add toasted pecans as well!